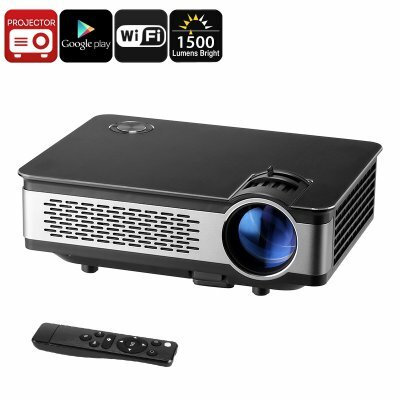 Successfully Added Android HD Projector - 1500 Lumen, 1280x768p, Android OS, 1GB RAM, 1080p Support, 120W LED, WiFi, Built-in Speaker, Google Play to your Shopping Cart. Its bright 120W light is capable of producing up to 1500 lumens. Thanks to this, you’ll be treated to detailed and vivid images. The light itself features a sustainable design and has a lifespan of up to 20,000 hours. When in use, your Android projector produces less than 45dB of noise. Therefore, you’ll be able to enjoy films and give presentations without being disturbed by bothering noises. This 5-Inch TFT LCD projector supports 1080 files, meaning it is capable of playing the latest movies out there. With a native resolution of 1280x768, your HD projector is sure to treat you with stunning visuals. Within its body, this Android projector packs a sufficient Quad-Core CPU that has been clocked at 1.2GHz. Along with 1GB of RAM, it allows you to enjoy basic Android Apps. Kodi 16.1 and Google Play provide you with access to an unlimited pool of free entertainment. Thanks to this, you and your friends will never have to experience a moment of boredom again. With 4GB internal storage and a 32GB USB port, this HD projector packs enough memory to keep all your files and media. Additional features such as DLNA, Miracast, and Airplay will further increase its overall usability. With 2.4g wireless support, you’ll even be able to use your Android projector with a wireless mouse or keyboard for extra convenience.